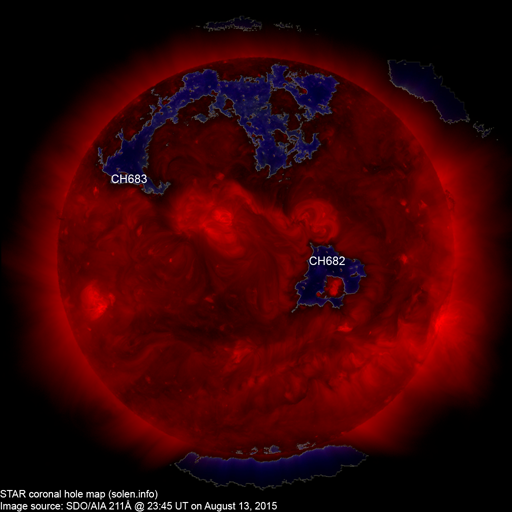 Last major update issued on August 14, 2015 at 03:55 UT. The geomagnetic field was quiet to unsettled on August 13. 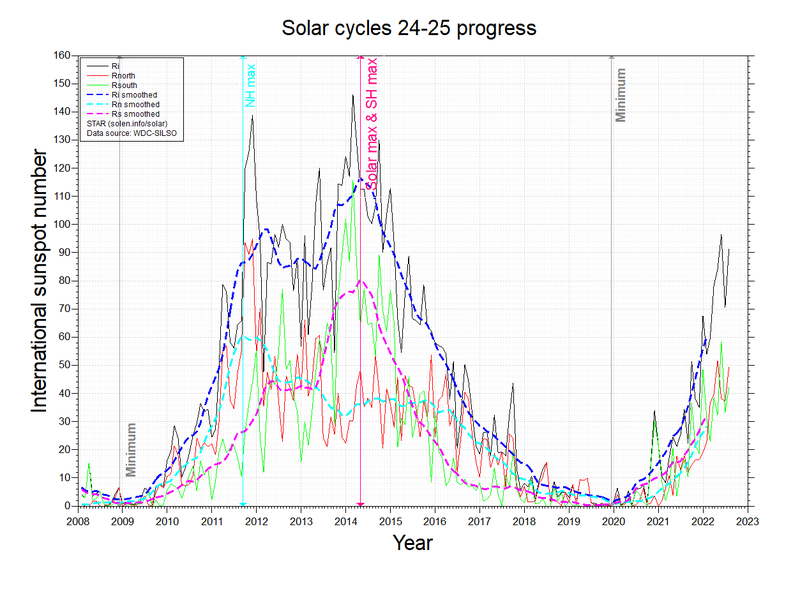 Solar wind speed at SOHO ranged between 322 and 360 km/s. 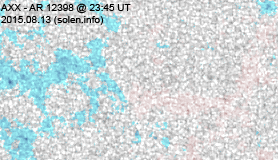 Solar flux at 20h UTC on 2.8 GHz was 94.8 (decreasing 2.6 over the last solar rotation). The 90 day 10.7 flux at 1 AU was 114.9. 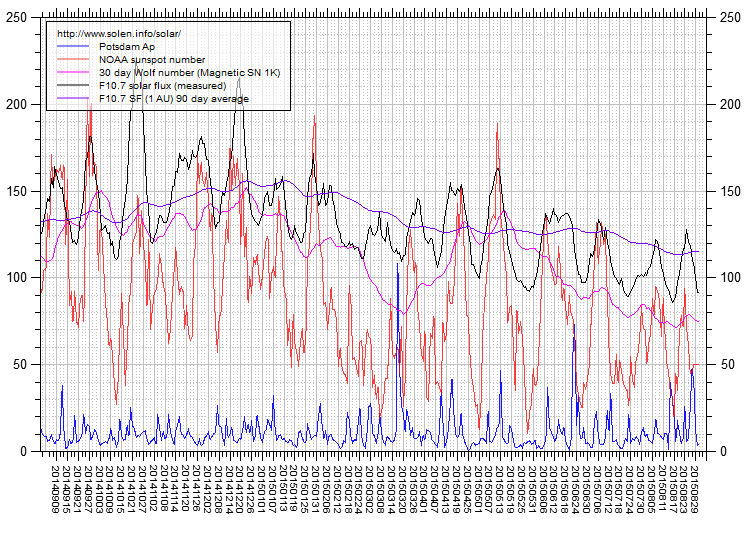 The Potsdam WDC planetary A index was 9 (STAR Ap - based on the mean of three hour interval ap indices: 8.8). 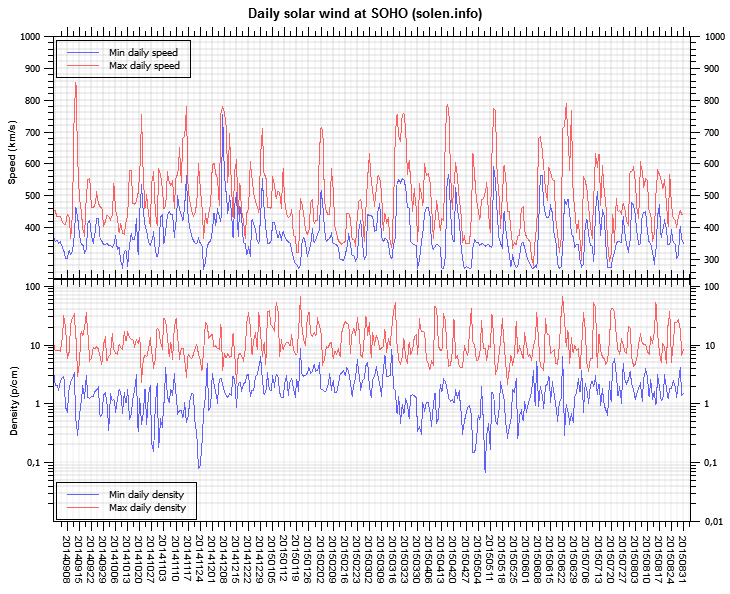 Three hour interval K indices: 33222111 (planetary), 34322211 (Boulder). 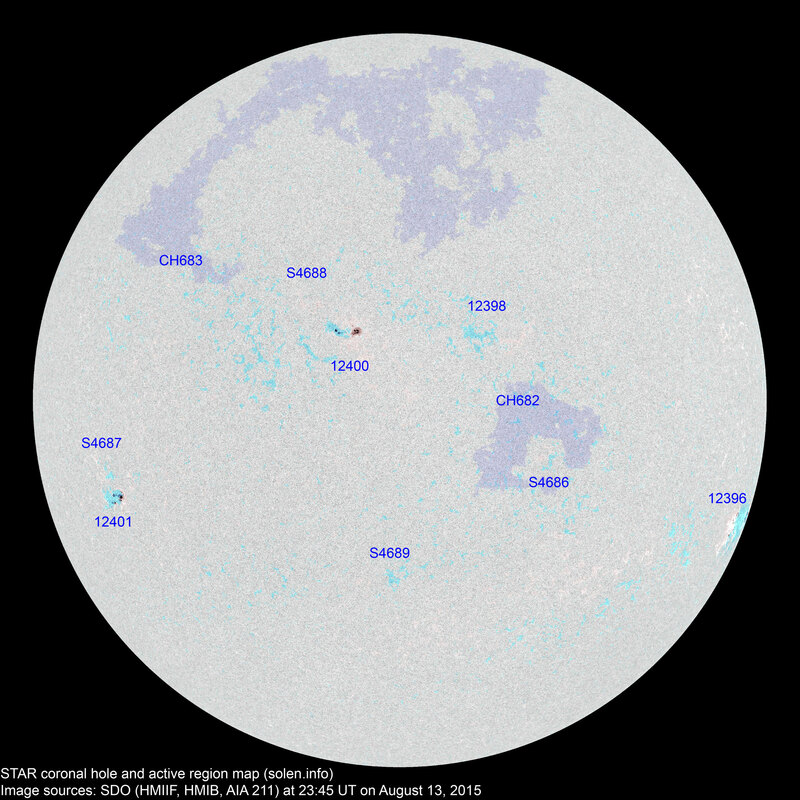 At the time of counting spots (see image time), spots were observed in 8 active regions using 2K resolution (SN: 129) and 6 active regions using 1K resolution (SN: 85) SDO images on the visible solar disk. Region 12396 [S18W80] decayed very quickly with no spots retaining mature penumbra by the end of the day. 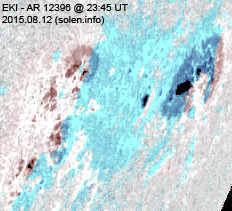 Region 12398 [N18W15] lost the leading polarity spots. Region 12400 [N17E08] developed slowly and quietly. New region 12401 [S11E51] emerged on August 12 with SWPC numbering the region the following day. The region is compact and a magnetic delta has formed. 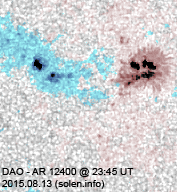 The region is small and growing and has produced several small C flares early on August 14. A minor M class event is possible. S4686 [S02W22] developed early in the day, then decayed and lost the leading polarity spot. New region S4687 [S07E54] emerged early in the day and decayed slowly towards the end of the day. 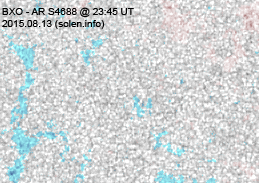 New region S4688 [N20E18] was observed with penumbra spots. 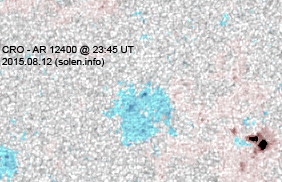 New region S4689 [S23E01] was observed with a penumbra spot. August 12: A partial halo CME was observed after multiple filament eruptions in the southwest quadrant. 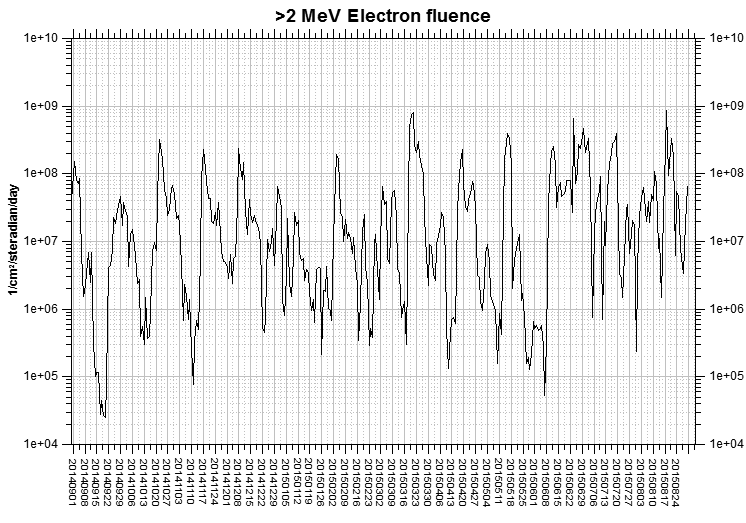 The first eruption began after 14h UTC and likely triggered a second eruption close to CH682. A recurrent trans equatorial coronal hole (CH682) was in an Earth facing position on August 12-13. An extension of a northern hemisphere coronal hole (CH683) will likely rotate across the central meridian on August 15-17. A co-rotating interaction region may be associated with CH683 and could cause a geomagnetic disturbance on August 17-19. The geomagnetic field is expected to be quiet on August 14. A high speed stream associated with CH682 could cause unsettled and active conditions on August 15-16. A CME associated with a filament eruption observed on August 12 could arrive late on August 15 and contribute to the ongoing disturbance.